The OS550-BB has been superseded by a newer version. Please refer to the OS550A-BB Series for the latest model . 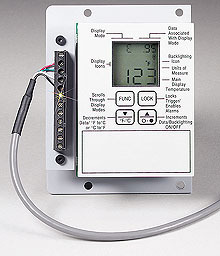 OMEGA’s OEM style OS550-BB Series industrial, high performance, economical thermometer/transmitter offers a wide choice of temperature ranges, optical patterns or fields of view and three outputs (1 mV/ degree, 4-20 mA, and 0-5 Vdc) to feed directly into panel meters, recorders, PLC’s, temperature/process controllers, data loggers, data acquisition systems or other process instrumentation. This OEM design coupled with their relatively small dimensions make these sensors ideally suited for a wide variety of applications. * One unit suitable for aligning many heads. 1-BB : Spot Size .35" @ 24"
2-BB : Spot Size .5" @ 3"
3-BB : Spot Size 1" @ 20"
4-BB : Spot Size 1" @ 30"
5-BB : Spot Size 1.2" @ 60"
6-BB : Spot Size .15" @ 6"